The New York Giants are a team that is one of the true enigmas of the NFL. Last season, the team’s offense was absolutely terrible, Eli Manning couldn’t stop throwing interceptions to save his life, yet amazingly, he threw for 3800 yards. The leading rusher on the team, Andre Brown, didn’t have 500 yards. 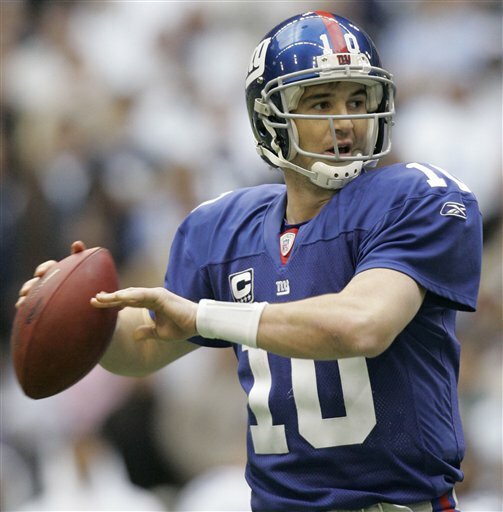 New York Giants quarterback Eli Manning is a two-time SuperBowl Champion, but with his play over the last couple of seasons, you wouldn’t know it. Manning has to be stronger this year in order for the Giants offense to click to help their strong defensive unit. This team had no business being 7-9. It was clearly a 5-11 or 4-12 team. The fact that they were able to scrape together a 7-9 record is a testament to the coaching of Tom Coughlin & the defense that kept the team in so many games all season (ranked 10th against the pass, 14th against the run). However, the heart of that pass rush, defensive end Justin Tuck, is now with the Oakland Raiders. The leader of that defensive unit will have to be Jason Pierre-Paul, who has emerged as one of the better pass rushers in the NFL over the last few seasons, learning from Tuck & the retired Michael Strahan when JPP was very young in the league. The Giants also add in Robert Ayers, defensive end originally with the Denver Broncos, who can get some pass rush going. Around the rest of the defense, the Giants are still extremely strong, especially in the secondary with Dominique Rodgers-Cromartie & Antrel Rolle patrolling the area in the back. The Giants defense will be among the top 10 in the NFL again, however, any defense is only as good as an offense that will give them support & allow them to make plays late in games. Speaking of that offense, its apparent that the Giants definitely needed an upgrade in the passing game to give Manning some support outside of just Victor Cruz. The team will depend on two LSU players this year, Reuben Randle & the rookie Odell Beckham Jr., who was a big time breakout star during the 2013 season. As per usual, the Giants will have a variety of running backs to help Manning some, but the New York Giants are never going to be an explosive offense, its not in their DNA. The Giants are always a team that will score 21 to 25 points every game & will be in a fight more times than not with teams, especially in the NFC East with the Cowboys, Redskins & Eagles. I can’t see the team being more than 8-8 or 7-9 & this may be the season that Coughlin might be out of New York. The team will show fire & desire, but you can only do so much when you don’t have the playmakers across the field. To learn more about the DraftKingsMaster, follow our website on Facebook & Twitter. First off, thank you so much for the comment. I greatly appreciate it. Ill admit, I am a bit sour on Eli Manning. I feel as though in a division like the NFC East, where there hasn’t been a quarterback to really take hold of the division in a big way, Manning, with his experience & SuperBowl victories & all, should be at an elite level at this point in his career. Even when he went to the Pro Bowl, the Giants should have been in a better position to be successful & they haven’t been since the Giants were in the big game in 2011. Fans need to expect far more out of Eli & this season its a make or break type of year, especially after being so atrocious in 2013.